At Prince of Peace, you will discover a warm group of real people dedicated to following our Lord and Savior, Jesus Christ. We want you to experience the welcome peace we receive each week from Jesus and from each other. Below you will find Worship Times, Directions, and additional information about Prince of Peace. A relaxed, upbeat Contemporary service led by praise teams on Saturdays at 5:30pm, with Communion every week. A Traditional service from the Lutheran Service Book hymnal on Sundays at 8:15am, with Communion on the 2nd, 4th, and 5th Sundays. A Blended service with liturgy, hymns and spiritual songs on Sundays at 11am, with Communion on the 1st, 3rd, and 5th Sunday. You can contact Prince of Peace by emailing , or you can call the Church Office at (703)451-5855. 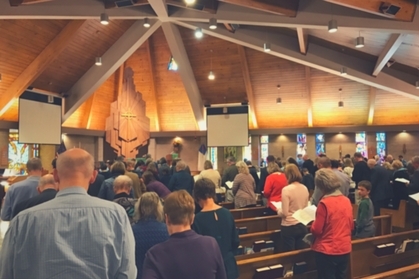 Prince of Peace is a hub of Spiritual Transformation, using God's Word, Sacrament, and Prayer, equipping to build networks of vibrant Christian communities extending to our homes, to our neighbors and beyond, making disciples of Jesus. Sola Gratia + Sola Fide + Sola Scriptura + Sola Christus... Meaning: Grace Alone, Faith Alone, Scripture Alone, and Christ Alone. At Prince of Peace, we have seen and experienced God’s power through prayer. If you would like to request prayers, click the link below. We would love to have you come and see what we're all about here at Prince of Peace! Which Worship service are you interested in attending?